A Mango Tree or Mangoes are connected with the summer. They are summer fruits that come from the lovely mango trees. They have amazing taste and fragrance and this is exactly what you need to have during a hot summer day. But in order to have mangoes what do you actually need to do? Below we are going to give you a detailed guide not only about Mango seeds but also about the Mango varieties and the ways that you can plant them whether you have a garden or you want to keep them in a pot. Also, we are going to give you details about the benefits that it has and ways that you can use not only the fruits but also the leaves. Don’t forget that a mango tree can actually leave for hundreds of years so if you follow our tips and take proper care of it then you will have long-lasting mango trees that you and your children will enjoy. There are 2 types of mango tree seeds, the first one is the monoembryonic and the polyembryonic. The monoembryonic seeds need cross-pollination so as to give single-embryo seeds. The seeds have both the female and male but that doesn’t mean that the size, the yield, and the quality will be the same. The polyembryonic seeds have numerous embryos. The fruits that these seeds produce are clones to the tree and most gardeners prefer them for cultivation. The tree that these seeds will give will have the exact traits of its parent. Each tree variety is different from one another in flavor, and texture. You can plant different varieties in your garden and have different flavors at different times of the year. India has many varieties of mangoes too and it is a very famous fruit that people love to have. In the U.S. and especially in Florida, mango trees flourish because of the climate, which is perfect for them. There are over 500 varieties that you can choose from. Different nurseries try to create new mango varieties that will be eventually available. Below we are going to see some of the varieties that you could have in your garden. The Haden variety is the most famous variety in the U.S. It was planted by Jack Haden in 1902 in Florida and it is up to now a well-known variety. The particular variety apart from the U.S. grows in Brazil, Costa Rica, Mexico, Ecuador and Australia. The original tree is in Coral Gables, Florida and it has produced many and different varieties. It has a bright red color and small white dots. Its shape is medium to large and it can be oval or round. The best season to pick it would be from March to May. Gary is a mango tree variety that grows in the U.S. It has a coconut flavor which makes it delicious. This tree produces small mangoes that have a yellow skin. It has an ovoid shape and it is considered to be one of the most tasteful varieties. The palmer mango tree variety has a mildly sweet flavor and its texture is smooth. It has an oblong shape and its color is deep cherry red and it has a green background. The country that it first originated is Brazil and you can find it everywhere including in Florida. Kent variety can be found only in the U.S. but also in Africa, Italy, Israel, Mexico, Ecuador, and Australia. The particular variety has a sweet and rich flavor which makes it delicious and its texture is tender and juicy. It has also a large oval shape. 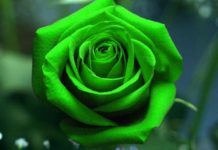 Its color is dark green and has a red blush. 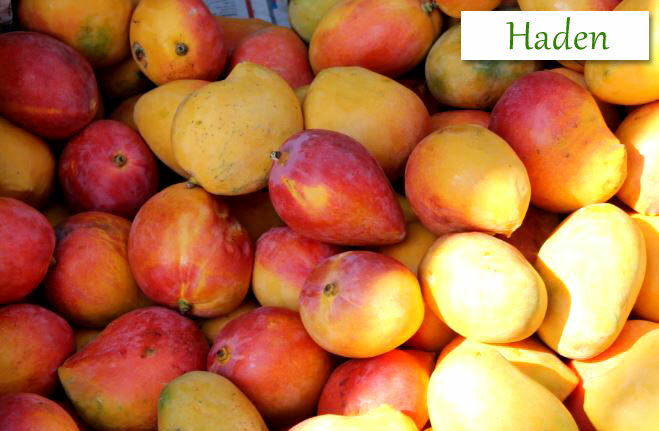 The best time to pick the mangoes would be from January to February, from June to August and December. You will understand when they will be ready to eat because they will have yellow undertones or dots. When you will squeeze it you will see whether it will be ready. 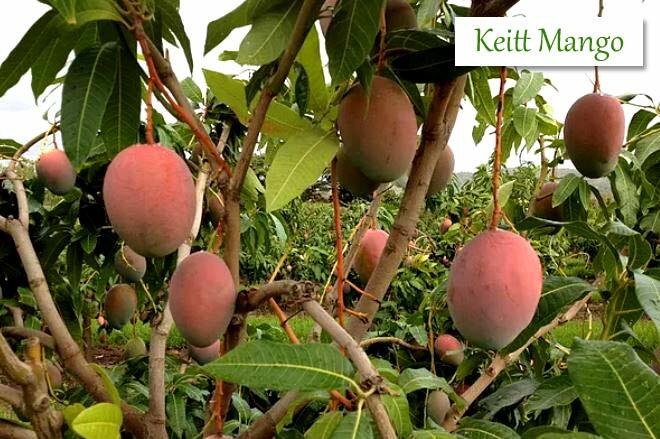 Keitt Mango has a sweet and fruity flavor. You can find this variety apart from the U.S. in Costa Rica, Italy, Africa, and Australia. It has a large, oval shape and the texture is firm and juicy. 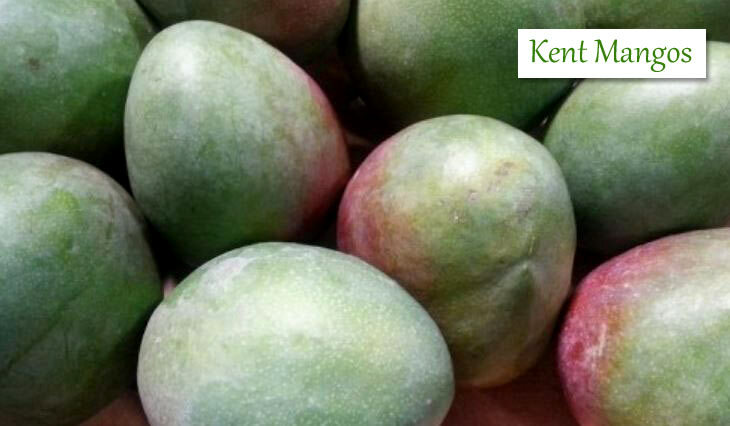 It has got a medium to dark green color that might have a pink blush at parts of the mango. If you want to know when it’s the right time to harvest it you will see that the skin is green and when you squeeze it, it should be a bit tender. The best season to harvest it is from July to September. 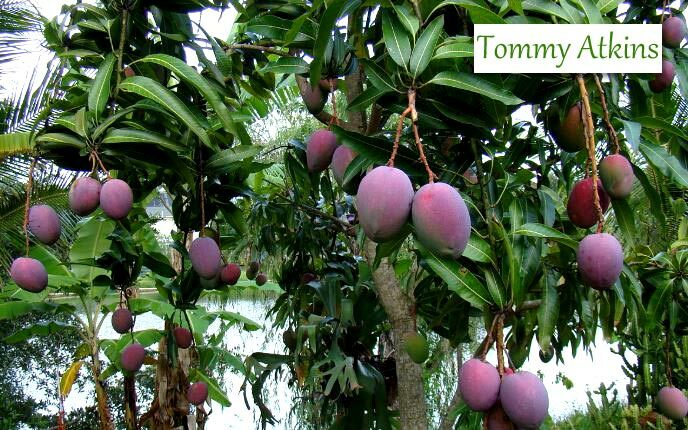 Tommy Atkins is one of the most well-known mango tree varieties in the world. It is the most well known and one of the best selling varieties that exist. You can find the specific one in the U.S., in Venezuela, in Costa Rica, Brazil, Italy, and Mexico. The only thing with Tommy Atkins is that it’s mildly sweet, compared to the other ones. Its texture is firm and it has a dark red blush. It has an oblong shape and its medium to large. You can harvest the mangoes from September to October and from March to July. Honey is also known as Ataulfo. It grows basically in Peru, Mexico, and Ecuador. 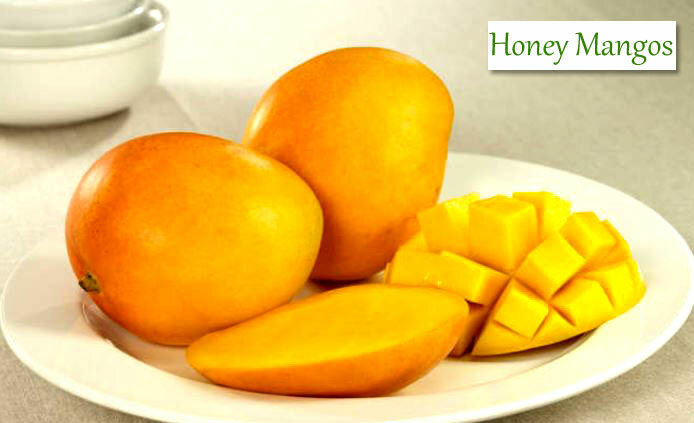 What is great about this mango is that it’s sweet and creamy and that it has a texture that is smooth, and firm. It also has a bright yellow color. It also has a small oval shape that is flattened. You will be able to harvest it when the skin of the mango has a deep golden color. 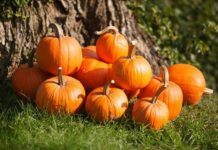 The best time to harvest the specific variety would be from March to June. 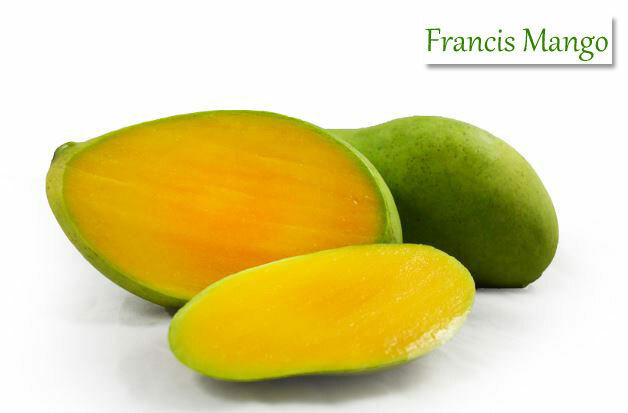 Francis is another mango tree variety that has a spicy, rich and sweet flavor that makes it unique. It is a variety that grows on farms all over Haiti. It has a juicy and soft texture with a bright yellow color. Its shape is oblong with a sigmoid S-shape. You will be able to harvest Francis when the green color decreases and the yellow starts to take its place. Make sure to squeeze it so as to understand. The best time to harvest it would be from April to June. Mango trees produce fruits between 4 to 5 months depending on the variety. For the fruits to mature, you will definitely need time between 3 to 6 months. The months that you will see the first fruits will be from May to September. Depending on how much you’re taking care of the tree you will get mangoes that will be delicious. Some of the varieties will produce 2 crops within a year. The mangoes are known to have plenty of vitamins, such as A, C, and B6. They have even proteins, copper, potassium, and carbohydrates. We aren’t the only ones that enjoy eating mangoes. Birds, squirrels, and crows enjoy eating them. Growing a mango tree can also be done in a pot. There are dwarf mango trees varieties like the Palmer, the Irwin, King Thai, the Ice cream, the Venus, and the Lemon Meringue that you can also keep in a pot. The normal mango tree can reach a height of 65 feet and live for many years like 300 years and they will still produce fruits. The dwarf mango tree varieties can grow very well in USDA zones from 9 to 10. In case you aren’t in these zones but you do want to have a mango tree then you can grow it in a greenhouse. The pot should be 20 x 20 (or larger if you like) and it should also have holes to drain the water. The soil that you will add to the pot should be lightweight but it should contain nutrients that are necessary for the tree. A good idea would be to add 40% forest floor mulch, 40% compost, and 20% pumice, which would be ideal. If you want to move it pot then you could buy a pot trolley. The first thing that you should do would be to fill in half the pot with the potting soil. Then you should place and center the mango onto the soil. Add the soil media and leave 2 inches from the edge of the pot. Finally, firm the soil and water the mango tree. You should also take care of your mango tree. In order to do that, you should place it in a warm place and it should get at least 6 hours of sunlight. During the warm months; water the tree at least 2 to 3 times a week and during the winter time 1 time in 2 weeks. Don’t forget to fertilize from springtime to summer. You can use fish emulsion, read the instructions and follow them carefully so as to have the best result. Fish emulsion is a great fertilizer and you can make your own. You could use this one instead of the chemical ones. You can use parts of a fish or even the whole fish to make it. The one that you will make will contain more nutrients than the made one because you will use parts of the fish or even the whole fish and not just the bones or the trash parts. The homemade one will contain bacteria microorganisms that are necessary for the tree. To make it add water, 3 parts of sawdust, 1 bottle of unsulfured molasses and the fish. Put it in a large container and stir it for 2 weeks and make sure that the fish are broken down. Then it will be ready for use. Dilute 1 tablespoon in a 1 gallon of water and then use it in your plants and trees. Prune the mango tree every winter and always take its limbs in order to support it when it will be ready to give you the mangoes. Don’t forget to prune it at the end of the winter or early spring, in this way it will maintain its shape and grow properly. Mango trees begin to produce their fruits in 3 years. What this tree need is to have a well-drained soil and warm temperatures. Before you water it again make sure that the surface of the soil is dry. The right temperature is important too. The tree needs a lot of sun and you should also prune it properly. Pruning your mango tree might not be an easy task because the tree itself contains chemicals that can cause dermatitis to some people. This might happen because it contains uroshiol, for this reason, you should cover up and don’t forget your hands because the leaves contain it too before you prune it. If it’s too high then you could hire an arborist who knows how to do it properly. You should prune your mango tree because you want to reduce the height and width but you want to increase the yield, the air circulation, and to control pests and diseases. You should prune it while the tree is young. When it will be from 2.5 to 3.5 feet you could prune it. It will grow faster this way. What you have to do is to clip the terminal bud and reduce the height by half. With the lower branches you can prune them up to 4 feet and in this way, you will find it easier to remove weeds, to water the tree and to apply your fertilizer. You should be careful though because with the established mango tree the pruning shouldn’t be more than 30% to 33% of the foliage. If you prune it more then you won’t be able to have many fruits but you’ll have more leaves than necessary. Additionally, you don’t have to prune your mango tree every year. This tree is the terminal bearer. This means that they produce flowers from the tips of their branch. They will produce blossoms only when the wood is mature enough. This means that at the end of May and June you shouldn’t prune it. The appropriate time to do it would be after it’s been harvested. Finally, you need to protect your Mango Tree from Bagworms. It is essential to trim your mango tree. In this way, you will eliminate the wood that has diseases or it’s dead. Start with a heading cut. The heading cut is when you make a cut in the middle of a branch. When you do it make sure that it’s 3 inches. The tree in this way will develop the 3 main branches. When these 3 main branches grow and become 20 inches then you should follow the same procedure. Repeat it every time that they’ll reach 20 inches. Also, a good thing would be to remove the vertical branches in order for the mango tree to maintain its height. You can repeat this process for 2 to 3 years until you can see that the tree has a solid scaffold and an open frame. Once you have established that then you will trim it once or twice a year. Don’t forget to remove the woody branches because you want to have more fruits. The tree will produce mangoes during the 2nd or 3rd year of its existence. 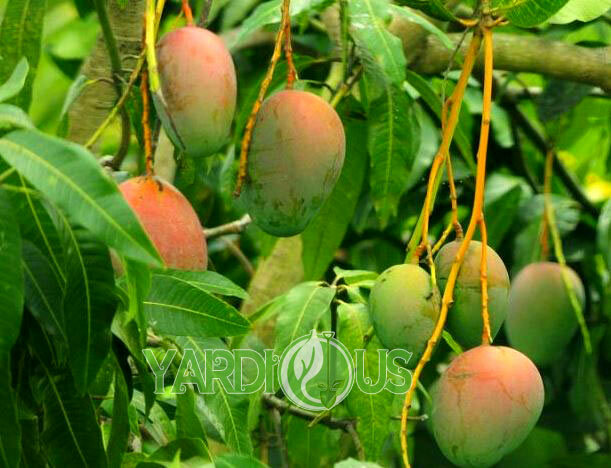 When you will get the first mangoes then the tree will stop growing in height and width and this will have as a result for the pruning time to be reduced too. You should prune it and trim it in order to have the shape that you want to. The soil plays an important role in the growth of your mango tree. This tree produces long roots that is why your planting would be 19 ½ feet deep. If you water it properly it can also grow well in 3-foot soil. You should also test the drainage of the soil. If the drainage isn’t the right one then the roots will rot. If you are facing a problem with the drainage then you could plant a slope, or you can create a mound. The right pH for the soil varies from 4.5 to 7. Mango trees don’t tolerate alkaline soil or salty soil. Test the soil with a testing kit in order to check it before you plant your seeds. There are many things that you can do in order to avoid pests and diseases and help the tree grow. Keep in mind that this tree can’t stand the wind and the frost. It needs a warm environment. If you see that the weather is changing then you can use a blanket to protect them and for the young trees, you can use stakes so as to be supported. There are two main diseases that mango trees are more susceptible. These are the powdery mildew and the anthracnose. Both of these diseases are fungal and attack the fruits and flowers. Powdery mildew is a fungus that destroys the leaves and the flowers. You will understand it by the white powder mold. You will find it in leaves which will eventually turn dark brown and they will have a greasy look. If you don’t treat it quite early then it might destroy the entire mango tree. Anthracnose is a disease that attacks the trees during the spring. It attacks the leaves and the twigs. When the weather is rainy then there is a possibility that the disease will spread and thrive. If you look closely at the leaves you will see small brown dots that have the size of a pinhead. Verticillium wilt, unfortunately, attacks the roots and the vascular system. If you start noticing that the leaves curl, discolor and wilt then that means they have verticillium wilt. It is a fungal disease that thrives during the spring and fall because the temperatures aren’t still very warm. It is quite hard to diagnose it because at the beginning it might look like an environmental problem. The leaves will change their color to yellow or red and they will become brown and then they will drop. This might happen only to one side of the mango tree. This disease affects the roots and moves its way up the tree. You will also notice dark streaks on the wood and if you cut a piece of it you will see rings that have a dark color. This will make you understand that the tree has the particular disease. The final one is the parasitic algal spot. The specific disease is the rarest one. It is known as the green scurf too. What causes it is a type of parasitic algae that has the name of Cephaleuros Virescens. If you see that the leaves start to have an orange, gray, green, or brown blotch on the leaves then the tree has an algal spot. All of these diseases can be controlled and even eliminated. 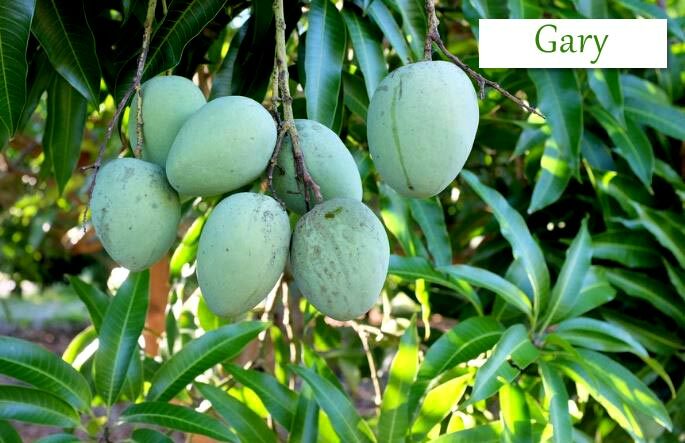 Below we are going to provide you with different tips in order to protect your mango tree. In order to protect your tree, you should use a fungicide before the infection takes place. You should start using it in early spring and use it again 10 to 21 days after in order to protect the tree since it will be the time that the mangoes will start to appear. You can treat anthracnose first of all by picking up all the dead parts of the tree and around it. Pruning it in the way that we mentioned earlier will also help. You should rarely use chemicals because there is always the fact that you can prevent the disease before actually happening. You can prevent powdery mildew by using different remedies like sulfur, triforine, potassioum bicarbonate. Since mangoes are fruits that you will eat avoid them and use a non-toxic fungicide because your health is what matters the most. You could ask at garden centers for advice in order to use both environment and chemicals in order to help your mango trees. You can control verticillium wilt by using solarization. Solarization is when the temperature of the soil warms 6 inches or more. This high temperature can kill the fungus. All you have to do is to prepare the soil by digging it and watering it. Make sure to cover the area with a plastic tarp. Once you ensure that, then bury the edges in a few inches of soil and in this way the heat will be held in. During this process make sure that there is plenty of sunlight and warmth so as the fungus to die. In general, you should know that the particular disease is incurable so take very good care of the mango tree. Algal leaf spot can be controlled in the following ways. First of all, it isn’t lethal for the mango tree as the verticillium is. All you have to do to protect the tree is to take care of it which means water it and fertilize it as we mentioned. If you do that then the tree will be just fine. Remove all the parts that might be infected in order to ensure that the infection won’t spread. Water the base and not the leaves, don’t forget that. If the disease insists then use a copper-based fungicide or a Bordeaux mixture. Repeat every 2 weeks. If in the end, if you notice that you have done everything you can, don’t give up. You can always consult the extension office of your area. They will be able to help you and give you further advice on how you can protect your tree. If you want to enjoy eating your mangoes earlier than usual you should use our following tips in order to have amazing juicy mangoes. What you should do first is to choose your seeds wisely. 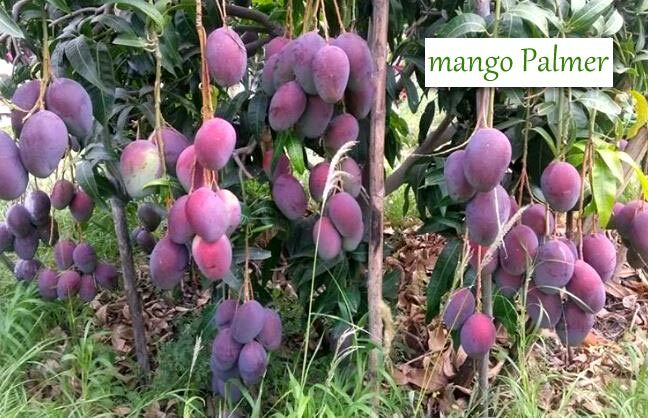 If you choose the right variety it will be easy for the mango trees to grow and have fruits. You can choose a polyembroynic seed. Choose a variety of mango that you like eat it and keep the seed. 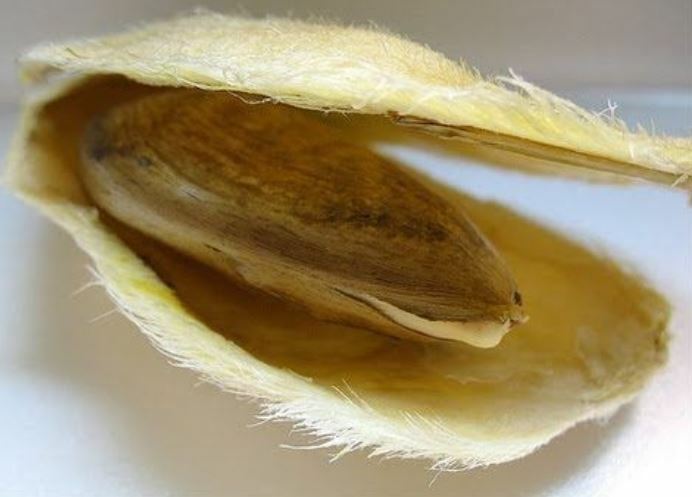 Clean the seed very well and let it dry in a place with shade for 1 day. Then you need to remove the hard husk. Early summer would be great to plant your mango tree in the garden. The best temperature would be from 25°C to 35°C, if the temperature isn’t the right one then you can start the whole process indoors and then transplant it in the ground. Place the seed 3 inches deep in the ground and then water it well. Water it for 2 to 3 times the first week. Later on, you will need to water it 1 to 2 times per week. Make sure that you’ll remove any unwanted seeds around your mango tree. Adding mulch (but not too many) will help you with unwanted seeds because they won’t grow. Don’t use a lot of fertilizer, only the right amount and make sure that the fertilizer will have nitrogen. As we mentioned earlier you should prefer the non-chemical ones. With this process, you will have mangoes from 2 to 3 years. Mangoes apart from being perfect for desserts, salads and smoothies are also a healthy superfood. The leaves of the mangoes can be used as an excellent herbal medicine. The leaves just like the fruit are full of vitamins and other nutrients like phenols and flavonoids. Warm your water and add some leaves to it. Leave it overnight and the next morning when you wake up filter the water and drink it. 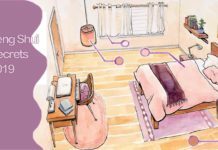 In this way, you will have a clean stomach and you’ll feel much better. Also, if get burnt you can use the ashes of the leaves and cover the area and you will feel better. Additionally, if you drink a decoction of the leaves and add some honey too you will treat the coughs and it will help you with asthma, bronchitis, and coughs. If you also feel anxious then you could add leaves to your bath water. You will feel refreshed and relaxed after that. Additionally, mangoes are great for dry and oily skin. If you have a dry skin then all you need to do is to mix pulp from mango with 6 spoons of yogurt. Apply it on your face and leave it for 15’, wash it off and you will see how different and smooth your skin will be. If you have oily skin then you need to apply mango pulp for 10’. Wash it off and you will see the difference immediately. Apart from the skin mangoes are great for our hair too. Mangoes contain vitamin E which helps with the hair growth. You can make your own mango seed oil that will improve the health of your hair. All you have to do is to use a jar of coconut to which you will add the outer coat of the mango seed. Then you will also add mustard oil or sesame (it’s up to you to choose which one you want to). Put the jar in sunlight for a few days and then apply it to your hair. You will have amazing hair that will be strong and this oil will prevent hair loss too. From what we saw a mango trees produces mangoes that are great not only to be consumed as fruits but they are great for our health too. Not only the fruits themselves have benefits but the leaves have too. Mangoes contain vitamins that are necessary for our health and our skin too. Mangoes have many varieties and what they need in order to grow is to have warmth and appropriate soil. Whether you keep them in a pot or plant them in your garden is your choice. We hope that our guide will give you amazing tips in order not only to plant mango trees but also to use them in order to improve your health. Enjoy!